Cloud solutions have gained a lot of traction in recent years due to their scalability potential. It’s hard to know which one to choose for your company with so many new options coming into the marketplace each day. Let’s clear up some of the confusion by taking a look at core features of popular cloud architecture services. IaaS functions similarly to traditional software and database management in that you retain hands-on control over every aspect of your infrastructure. The main difference is that a cloud server is used instead of a physical one. Using a provider’s cloud server eliminates the overhead that comes with maintaining a data farm like the costs of air conditioning, power, and internet connections. You must provide everything required to make your architecture work, with the provider usually offering some low-level maintenance. You’ll be responsible for installing and maintaining all databases and software on the cloud server. Any money you save by doing away with an on-site data center could be eaten up in the time it takes to keep up with the continuous needs of your software stack. This could potentially slow down the delivery of your applications to market. PaaS differs from IaaS in that you also pay the provider for the use of software and database infrastructure instead of purchasing your own. It’s all still housed in the cloud, lowering the IT costs for your company. The provider installs any needed components on the server and takes responsibility for performing maintenance and implementing any changes. This frees up resources for development, allowing you to get products to market more quickly. Customization is very difficult since you’re sharing common tools with other companies using the service. That forces you to work with what the provider offers and tailor it as best you can to your own solutions. Think of it as a more focused form of PaaS. DBaaS providers build and maintain cloud database solutions for customers. You pay the provider to build and maintain your database solutions in the cloud instead of doing it yourself on-site. They maintain control over all aspects of the infrastructure. Any changes requested must work within the environment of the provider’s cloud servers. That also applies to any third-party tools you want to use for tracking and monitoring purposes. 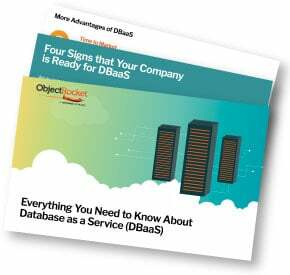 ObjectRocket offers DBaaS solutions to companies of all sizes. We understand that you want to focus on creating, not maintaining, so our company makes things as easy as possible. You won’t be charged for any help with migrations, optimization of queries, or database reviews. ObjectRocket allows your company to keep building while we take care of the backend. We offer the opportunity to try out a NoSQL database instance for 30 days at no charge, with 24/7 support. Learn more about our DBaaS offerings.